Sweet potato is a veggie that doesn’t immediately come to mind as one to use raw, but it’s wonderful uncooked! 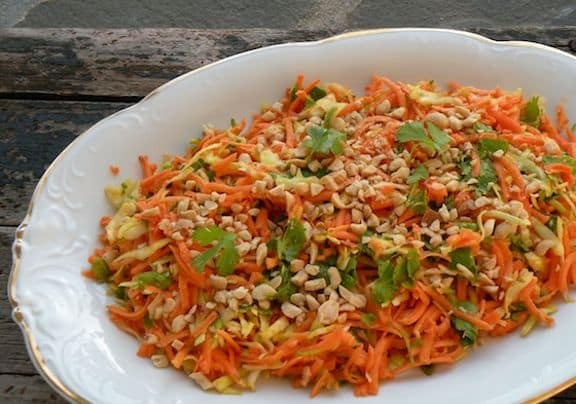 Combined with cabbage and some mildly Thai flavors, this easy (and rather addictive) salad is a treat all year around. 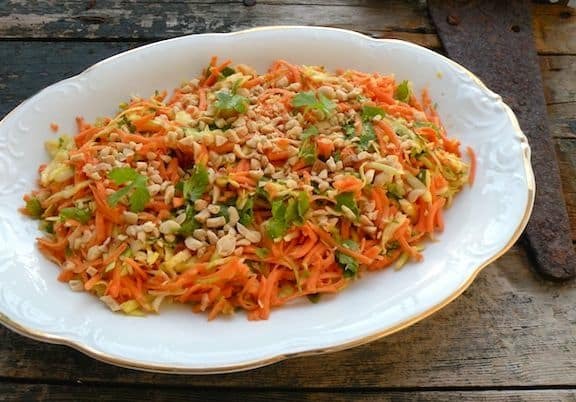 See the variation of this salad using kale, which is, like sweet potato, just as good raw as it is cooked, if not better! Put the sweet potato chunks through the grating blade of a food processor. Combine the sweet potato and cabbage in a serving bowl with the remaining ingredients and stir together. Let the salad stand for a bit to allow the flavors to marry—about 30 minutes should do. Stir once or twice during that time. I loved this! I added some basil with the cilantro and used a tad bit more dressing than was called for but otherwise it was great! I’ll be making this a lot. Lisa, I like to encourage readers to tweak recipes to their own taste and creativity. Glad you enjoyed this and I love your addition of basil! This sounds incredible! I’ll report back after making it.